The newest title in the series Survivor Stories, this book tells the story of Paul Allen, a photographer who likes opera and was a good baritone singer. At the age of 56 he sustained a stroke that left him paralysed and speechless. He has Locked-In Syndrome (LIS), a rare consequence of brain damage. Although Paul is fully conscious and his cognitive abilities are intact, he is unable to move or speak due to the paralysis of nearly all his voluntary muscles. However, Paul is keen to communicate and through his eye movements he tells his story, from his early life, career, singing and other interests, to the details of his stroke and the effects it has had on his life. The book also includes contributions from Paul’s wife Liz, who tells the story from her point of view, along with Paul’s physiotherapists, occupational therapists, speech therapists, psychologists and others from the Raphael Hospital who have assisted in Paul’s rehabilitation. In telling of his frustrations, his successes, his views on life and how he sees his future, Paul raises awareness of the quality of life possible for those with LIS. Combining scientific knowledge with personal narrative, this unique and optimistic book is of huge importance to any professional involved in the care of someone with a brain injury, and to the individuals and families touched by LIS. 1. What Is Locked-In Syndrome? What Causes It? Who Is Most at Risk? Do People Recover from this Condition? 3. Neuropsychological Assessments of Patients with LIS: How Normal Is Their Cognitive Functioning? 4. Is it Always Easy to Diagnose LIS? 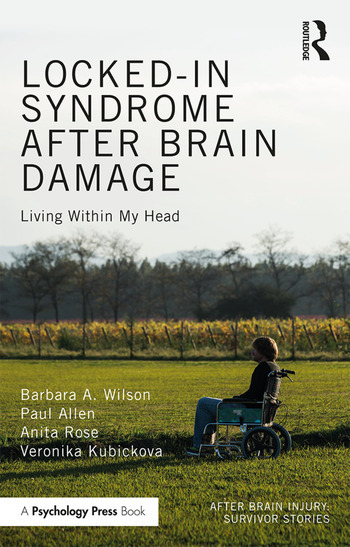 Barbara A. Wilson is a clinical neuropsychologist who has worked in brain injury rehabilitation for 40 years. She edits the journal Neuropsychological Rehabilitation. This is her 27th book. Paul Allen has lived with Locked-In Syndrome since 2012. Before his stroke he was a singer, photographer, computer programmer and project manager. Anita Rose is the Consultant Neuropsychologist and Director of Therapies at the Raphael Hospital, UK and also works as an independent consultant across the globe. She has researched and published extensively on brain injury, chronic neurological conditions and multiple sclerosis. Veronika Kubickova is a trainee clinical psychologist at the University of Oxford, UK. Previously having worked as an assistant psychologist in neuro-rehabilitation, she has helped people re-adjust to life after brain injury. After qualifying, she plans to work with refugee children who have experienced trauma.